S SOON AS ELIZA HAD LEFT for Europe, I visited the house on my own. I told my parents that, as a diligent lad who took his duties seriously, intended to get right down to work, and meant to go about this in an organized way, I’d be spending most of Saturday looking the place over and making an inventory of what was required, listing the jobs that would have to be performed, and making a schedule on a calendar that I had been given when I visited the showroom of Babbington Studebaker. I think I gave a fine performance. “Stay out of trouble,” said my father, but that didn’t necessarily mean that he had seen through my act; he said it all the time. There wasn’t any reason to think that he knew that what I really intended to do was snoop around. At the back door to Dudley’s house, I lifted the mat and found the key. I picked it up. I held it in my hand. It was heavy. I held in my hand the key that would—could, might—unlock the mystery of my paternity. I paused, since I had begun thinking of myself as a character in an allegorical tale, and reflected on the step I was about to take. I opened the door. I stepped inside. I was in the kitchen. It seemed not very different from any other kitchen, and not at all like the start of a new phase of my life. I walked the length of the hall that ran down the center of the house and looked through the glass set into the panels beside the front door. I imagined Dudley waiting for my mother to come up the walk and ring the bell, and I decided that if I were he I would not be waiting there at the door, nervously watching out the window. If I were awaiting a visit from the girl next door, I would be elsewhere, in the kitchen, perhaps, fixing a snack, or in the living room, sitting in front of the fire, reading a book, sipping a drink, scarcely aware that the time had come when the girl was expected, certainly not annoyed that the girl was late. The living room was just off the entry hall, to my right as I stood facing the front door. In front of the fireplace, two chairs faced each other. I had often sat in one of those, with Dudley in the other, and listened while he lectured. His lectures were usually instigated by my mother, who would send me to Dudley if I asked a question that she couldn’t answer—or didn’t want to answer. I would pedal on down to Dudley’s house, usually in the evening. He and Eliza would greet me, and we would all chat about nothing for a while. Dudley would have a drink, and Eliza might, too. She would make me cocoa if the weather was cold, lemonade if the weather was warm, and then after a while she would excuse herself, close the pocket door between the living room and dining room, leave through the door to the hall, and close that behind her, leaving me alone with Dudley. There had been a time when I had enjoyed those sessions, when I welcomed the information and advice Dudley gave me, but I came to enjoy them less and less as I came to think that I knew more and more. I no longer wanted to know what he thought I ought to do; I wanted to decide for myself. I was impatient with his counsel. I fidgeted while he spoke, and I rarely did as he advised me to do. I didn’t want him as a mentor, and he decided that he didn’t want me as a pupil. “I think that I can think for myself,” I said. “That may be,” I said, “but the lot that I have to learn is—” I stopped. I didn’t know what to say. If there was something clever somewhere in my mind that I could stick onto the end of my sentence, I couldn’t find it. “Yes?” asked Dudley, with a hint of a smirk and a raised eyebrow. Nothing. I got up out of my chair and left the room. I did not allow myself to run, though I wanted to run. I closed the door behind me, and I stood in the front hall for a moment, trying to recover my self-esteem. Eliza put her head around the corner of the door to the kitchen and looked down the length of the hall at me. “I’ve got a lot to learn,” I said, and I let myself out the front door and into the night. I should like to see the custom introduced of readers who are pleased with a book sending the author some small cash token: anything between half-a-crown and a hundred pounds. Authors would then receive what their publishers give them as a flat rate and their “tips” from grateful readers in addition, in the same way that waiters receive a wage from their employers and also get what the customer leaves on the plate. Not more than a few hundred pounds—that would be bad for my character—not less than half-a-crown—that would do no good to yours. Inflating a Dog is a work of fiction. The characters, incidents, dialogues, settings, and businesses portrayed in it are products of the author’s imagination and are not to be construed as real. Any resemblance to actual events or persons, living or dead, is entirely coincidental. 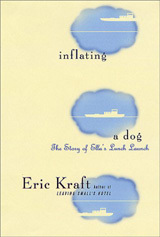 Picador USA will publish Inflating a Dog in the summer of 2002. For information about publication rights outside the U. S. A., audio rights, serial rights, screen rights, and so on, e-mail the author.